There are many people for whom going to Disneyland is a lifelong dream, for whom mingling with 50,000 of their closest friends provides a huge thrill. My wife is not part of that group. She hates crowds. So when we figured out how to swing a trip to Los Angeles and include a day at Disneyland, I knew that it would be me and the kids and nobody else. On the one hand, this was exciting: I'd get 72+ hours of one-on-one (or one-on-two) time with my kids away from all the distractions of day-to-day life at home. One the other hand: me, two kids, and a big public place. I'm confident in my parenting and child management skills (not to mention my directional skills), but traveling solo with kids provides a whole different set of challenges. This is step #1, of course, and one that you may have the least flexibility on. For us (like many), we were constrained by the school year and while we weren't totally opposed to pulling the kids out of school for a day or two for a decent vacation-related reason, that was not in the cards for this trip. I heartily recommend Touring Plans' Disneyland Crowd Calendar, which predicts crowd levels for every day of the year. You can get predicted crowds for the a month out for the next month without subscribing. Subscribing unlocks the entire crowd calendar, and is well worth the price (which is $0.99 per week, $1.99 per month, and $6.99 per year when done through its Lines app). Even if you have a lot of flexibility in your schedule, it's not as simple as picking out the day that has the lowest crowd levels, of course. Outside of the summer months, park hours are shorter (which may or may not affect your time in the park depending on your kids' stamina) and rides are more likely to be out of commission, either for holiday-related overlays (particularly after Labor Day as they prep for Halloween and Christmas) or major refurbishment. So if there's a particular ride you remember going on when you were a child that you want to revisit or there's some movie or character whose ride you want to make sure your child gets to experience, you can check the Mouseplanet weekly Disneyland update for and other items of note. But as any parent who has been in a crowded place with their kids knows, it can be a lot easier to keep track if it's not packed like a mosh pit. Disneyland Main Street. Look at the total lack of crowds. Get. Up. Early! For those of you traveling to Disneyland and without the advantage of a local friend with a spare bed or three, you'll need to find a hotel. Actually, even if you have a local friend with a spare bed or three, depending on your budget, you may find it worthwhile to stay in a hotel, at least for each night before your excursions into the park. That's because there are so many advantages to staying as close as you can that investing the extra $100 (or more or less) per night could add much more value than that to the hundreds of dollars you're spending on park tickets. I would suggest that choosing a hotel at Disneyland is like finding a house - pick the best one you can afford in the neighborhood you want. In this case, the neighborhood is called "Within (15-Minute) Walking Distance of the Front Gate." (I know, not very catchy.) I cannot stress enough the importance of being close enough to walk out of the park and being in your hotel room, collapsed on the bed, in maybe 10 minutes. Much longer, and the walk will seem too daunting at 2 pm or 8 pm. And, yes, you can take the Anaheim Resort Transit shuttles, but there is inevitably waiting time at either or both ends of the return/departure swing, not to mention the farther away you are, the less likely you are to return quickly. It's like the Disneyland gravitational field. Sleeping Beauty Castle at Disneyland. Crowded? Hardly. For what it's worth, we stayed at the Anaheim Plaza Resort, whose rooms were basic but fine, and which has a large pool (which they define as Olympic-sized). More importantly, for the purposes of this discussion, it was about a 10-minute walk from our room to the Mickey "compass" smack dab in the middle of the entry plaza. Most of those close hotels are on Harbor Boulevard, the north-south street that is the resort's eastern boundary. Some of the hotels on Harbor are actually closer to the Mickey "compass" than the 3 Disney hotels (Disneyland Hotel, the swanky Grand Californian Hotel, and Paradise Pier Hotel) for a fraction of the cost. What you miss by staying in a non-Disney hotel, besides the immersive Disney theming, is the right to go into the park an hour earlier than everyone else. The Extra Magic Hours, however, only apply (at this point) to the summer. It's unclear whether those Hours will continue. Whether it's worth the $200 or more per night that will cost you, only you can decide. But the being close to the resort, that's non-negotiable. And I know that there are plenty of hotels that are connected to the resort via a shuttle, either their own or the Anaheim Resort Transit shuttle. All I'm saying is that we stayed at one of those hotels way south on Harbor (easily 1 1/2 miles from the resort) 4 years ago, and waiting for the shuttle to arrive, negotiate Harbor Boulevard traffic, and deposit us about a 3-minute walk from the "compass," took us a lot more time and wasn't that much cheaper (especially when you thrown in the cost of the shuttle) than the Anaheim Plaza Resort. And it took a lot more effort to get ourselves back to the park after a mid-afternoon break. I know, you're on vacation, your kids are on vacation, you want to enjoy the time together, the last thing you want to do sometimes is set an alarm for a time that might even be earlier than a school morning. I'm telling you, you can get so much done before 11 AM that the rest of the day is almost like a bonus because a lot of people aren't setting that alarm. Again, one of the advantages of staying close by is that you can set that alarm 15-30 minutes later. We were probably up and moving by 6:30 AM. After getting ready and having breakfast, we left about 7:35 AM and were at the Disneyland front gates before 7:50 AM to find... they were open. That's right, they'll often open up early (remember, there are already some early guests in the park) so that you're almost at Sleeping Beauty's castle at the center of the park. This means you can spend some time strolling down the Main Street USA section of the park admiring the theming; it also makes getting to the rides that much easier. I am telling you, if you do one thing, it's get to the park before it opens. I assure you, I've done the not-early thing, and it makes a huge difference. 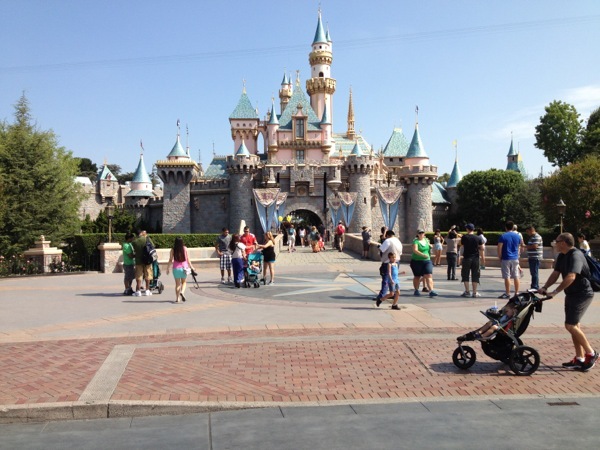 Look at those pictures of Main Street and the Castle above -- those were taken at 7:50 AM and about 10:15 AM, respectively. On a busy summer Friday. Get there early enough, and the park is yours. We didn't follow the Touring Plan I created to the letter -- especially if you and/or your kids are new to the park, you and they will be distracted by certain attractions and telling your kids, "no, we can't ride Astro Blasters now, the Plan says to ride it at 8:15 PM!" is inflexible to the extreme. But because we were there so early, we rode more than half of the Fantasyland rides and navigated the temporary shutdown of Splash Mountain and Big Thunder Mountain Railroad with nary a problem. While there were rides that I (or Miss Mary Mack or Little Boy Blue) would have wanted to ride (or ride again), we probably went on more rides in one day than in my comparatively uninformed two-day trip with Miss Mary Mack years ago. By about noon or so, the park really does start getting crowded, and it is harder to find top-level rides and attractions without significant lines. That's the point at which finding meals and other ways to help give your overstimulated and underhydrated kids a break is important. We had our fancy meal at Cafe Orleans for lunch (those are the Pommes Frites above), but Disneyland's meal prices, while expensive, aren't dizzyingly so. They're reasonable for a captive market. And while you're not supposed to bring in food, the bag searches at the entry to the parks will permit things like waters and snacks, so it is possible to keep your kids hydrated and nourished (sort of) without having to spend money on every last snack. 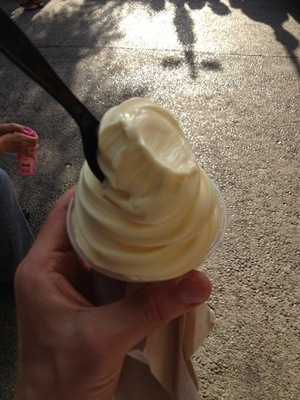 Which isn't to say you might not want a Dole Whip (soft serve ice cream blended with pineapple juice - delish! ), just that you can use those opportunities as diversions and treats rather than essential nourishment. You can, if you wish, leave the park, and on a hot, summer day -- or even other days -- this is a pretty good idea. We retreated to the hotel for a dip in the pool and Olympics on the TV. (We don't have cable at home, so I remember one of Miss Mary Mack's treats on our last trip being able to watch the Disney Channel in the hotel). Hopefully they're relaxing, taking in some fluids, resting their feet, and just generally "resetting" from a long day (which at that point already included about 6 1/2 hours in the park). Preschool-aged kids and toddlers may even take a nap -- so much the better. Obviously, if the park is only open from 10 AM 'til 6 PM, then you might not want to take a break in the middle if your kids' sleep patterns can avoid it. But if you're there in the summer months, I recommend the mid-afternoon break highly. It's a Small World at sunset. Disneyland is not cheap. Kids ages 10 and up pay "full fare," and those between the ages of 3 and 9 aren't much cheaper. Our one-day tickets limiting us to the use of just one park (we chose Disneyland rather than California Adventure, which is being overrun this summer by folks wanting to experience the just-opened Cars Land) cost $249 for the 3 of us. Multi-day tickets and "park hoppers" (which permit switching between parks during the day) would obviously drive that price up considerably. That's one reason why I recommend staying in a close hotel -- we spent probably a total of more than 11 hours in the park, and that's something we could only have done if we had stayed in a hotel that close the night before and the night after. We invested in the hotel (a bit) so as to maximize the value of those tickets. As for saving money on food in the park, good luck with that. Like I said, I didn't think the food prices were terribly outrageous, but they're not cheap. At "counter-service" restaurants, you are more likely to be able to mix and match meals and may find that a single adult meal may be sufficient to feed you and a kid. As always, bringing waters and snacks will help reduce the mid-morning, mid-afternoon, late night munchies. Not totally eliminate them, of course, and part of the fun of an immersive environment like that of Disneyland is to try the food. On that note, I'm sure you all have your own rules for spending money our trips, but for what it's worth I let each kid spend no more than $15 of their own money, and they were perfectly happy with that. Letting them know that the trip itself was their gift drew no whining on their part. Another way to extend the experience is through a character meal. There are character meals in the parks themselves, but you can also have character meals in which a variety of Disney characters stop by, interact, and pose for pictures. The meals are, again, on the expensive side (especially for what tends to be a buffet), but if your kids are particularly into a character, the opportunity to have a relaxed (and air-conditioned) interaction may be worth the cost compared to waiting in line 30 minutes in the park. We had a Sunday morning buffet at the Storytellers Cafe at the Grand Californian Hotel. The buffet was pretty good, Little Boy Blue (and Miss Mary Mack, a little) enjoyed the characters, and it gave us an excuse to go through the hotel, which is a themed wonder. Again, you don't need to have a meal here to wander through, but it was a nice way to extend the Disneyland experience before heading home. Bring water. It seems like you shouldn't have to remind people, but I'm doing so just in case. I brought water (those foldable plastic bottles that are now all the rage), but wish I could have brought more. Bring a small backpack. What I really wanted to bring was a fannypack, but I couldn't find mine -- maybe I'd tossed it out. I didn't want to haul around a backpack, which meant my pockets were stuffed full of stuff. Next time, I'll find a fannypack (or a small backpack) so I could store more stuff, like my sunglasses. On that point: When they say you can lose your sunglasses on Big Thunder Mountain Railroad, they're not kidding. Assess your kids' maturity level before you go. Miss Mary Mack is mature for her age; Little Boy Blue not so much for his age. Just because he was tall enough to ride Indiana Jones doesn't mean (in retrospect) he should have. That sort of assessment is especially hard to engage in if you yourself have never ridden the ride (which I hadn't), though I suspected it would be somewhat dicey. In some respects, I spent a good part of the day bouncing between ride types -- a slow ride that would be Little Boy Blue's speed and a fast ride for his older sister -- and telling each of them that they would get to do something they wanted to do next. If your child is mature enough (and certainly in double-digit ages), you may choose to let them ride via a single-rider line, which some popular rides have and which may let the person ride with less than a 5-minute wait. That's a good way to let the older child have some freedom ("yay! I get to ride by myself and without my younger brother") without too much of a wait as you park yourself outside the ride exit. Finally, remember to have fun. That goes for you, the parent, too. As parents, we can get so wrapped up in trying to make sure our kids have a memorable experience that we forget to have a memorable experience (and ruin theirs, too). Have a plan, permit yourself to deviate from it, watch your kids laugh, snap a few pictures, and laugh yourself. I'd like to think that I did fairly well in that regard. And considering the kids want to go back, I guess I did. Note: This piece was originally published here. Posted in Family Travel, Theme Parks and tagged with Disneyland, California, Anaheim, Los Angeles, Southern California, family travel, Disney. October 7, 2014 by Stefan Shepherd.